Happy Monday! (Although, can it really be happy if it’s a Monday? 😉 ) I don’t usually post on Mondays but there is a whole lot of Christmas goodness going on and I have a lot to share with you. Hosting season has officially begun in our home. Christmas is the time of year that we love to have all of our friends and family over. There’s something special about sharing our home when it’s decorated for Christmas. I thought I’d share with you how I prepare for hosting a dinner party. 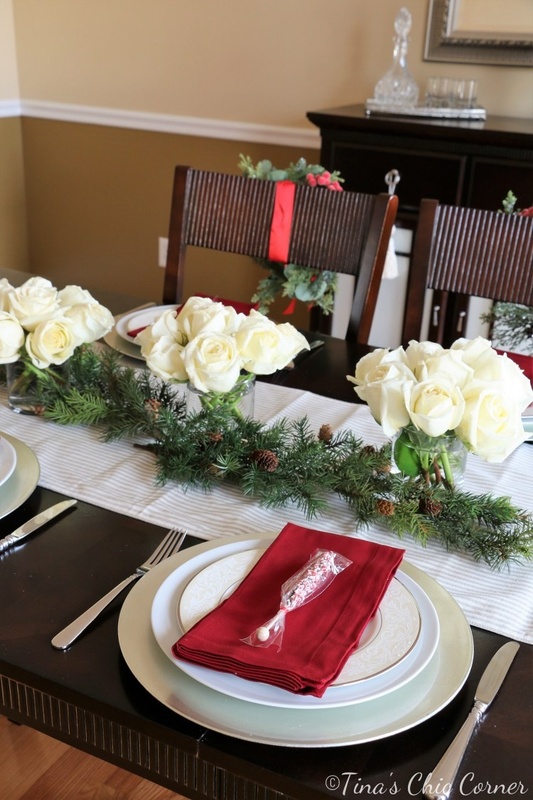 It’s the season for tablescapes (i.e pretty table decor). I have one rule that I live by when I create a centerpiece on the table. Always, always, always keep the height of the centerpiece low. That way I can see the people sitting across from me. You shouldn’t have to lean at funny angles to hold a conversation with your friends over dinner. If your centerpieces are preventing easy conversation there is definitely something wrong. This year I went with a very simple look. 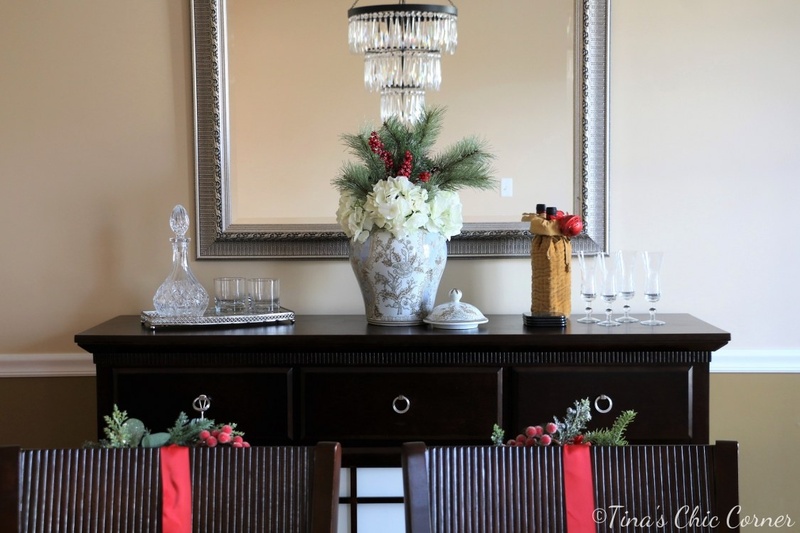 I used a neutral colored table runner to set the scene and then I placed faux greenery in the center. I usually use fresh flowers in some way because they are so pretty. I don’t usually buy flowers throughout the year because flowers can be expensive, but I like to think entertaining is a good excuse to treat my guests (and myself). They just add the right touch and bring warmth to any room. I usually buy my flowers at a grocery store because they tend to have the best prices. Although as a heads up, they also don’t always last very long. I suppose this is one of those things where you get what you pay for. 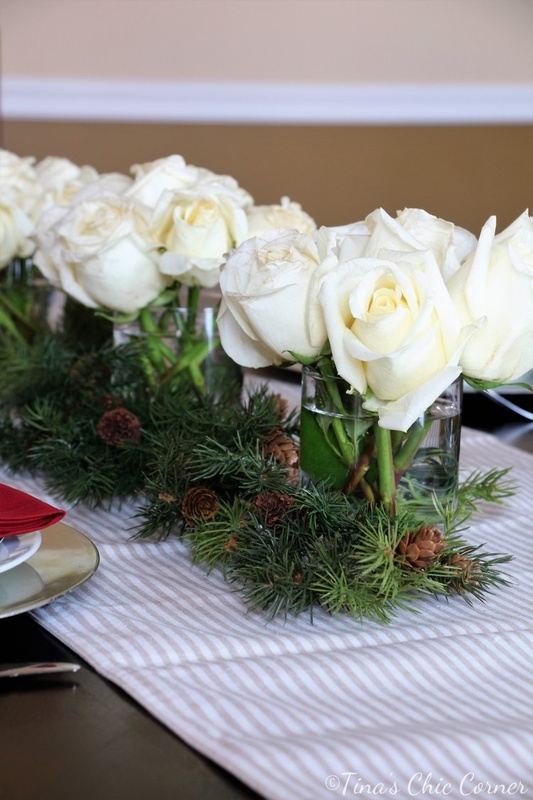 If the goal is to have nice flowers for the dinner party then simply buy them the day before. They only need to last until everyone goes home. 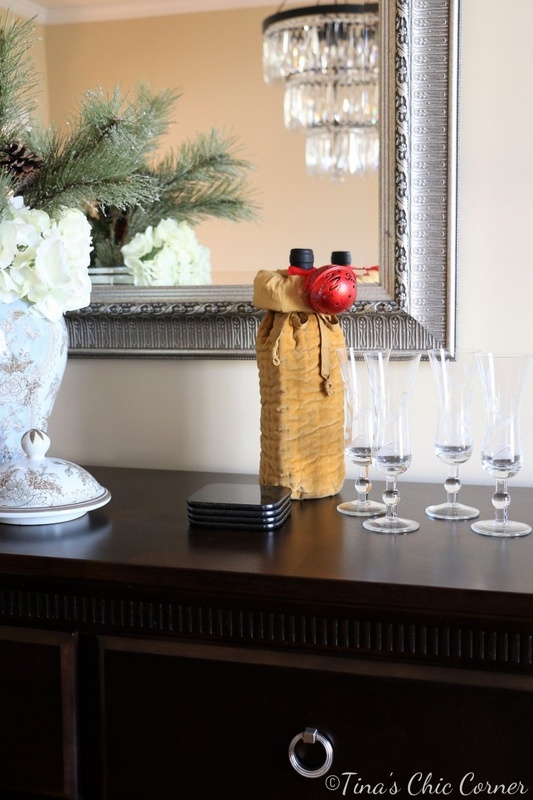 Any color flowers will work with this centerpiece. The white roses at Whole Foods looked the best so I went with a monochromatic look. I have a lot of fun creating the place settings. I used a silver charger (i.e. the base of the place setting). This has no function whatsoever but it sure makes it look pretty. I used a basic white dinner plate and topped it with a cream patterned accent plate. 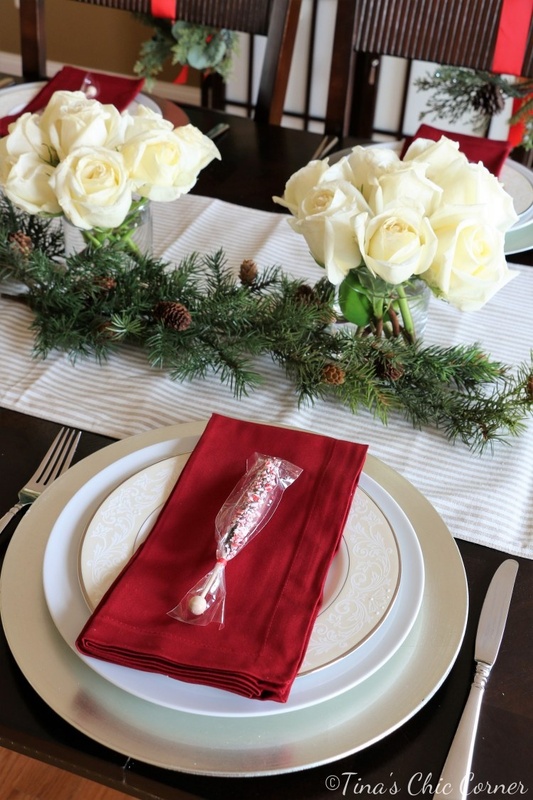 I wanted to add a pop of color to the table so I used red napkins to give it a holiday feel. 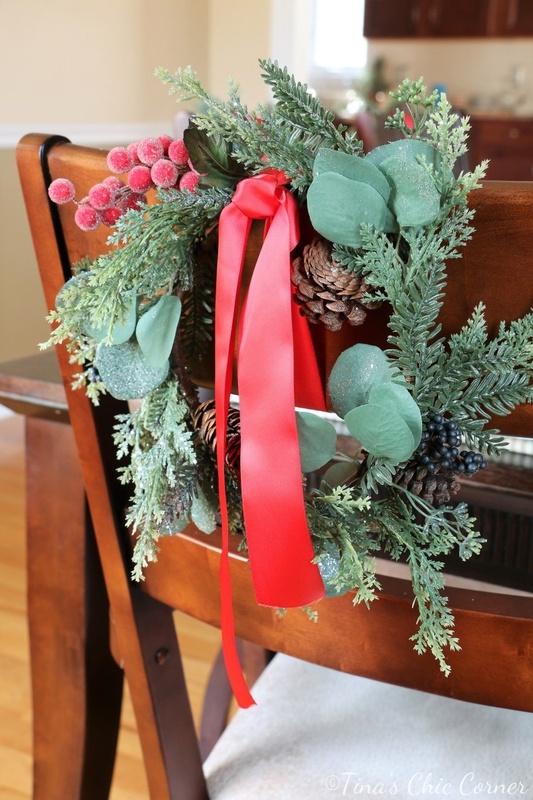 Last year I hung small faux wreaths on the back of the dining room chairs. They looked beautiful but I swore that I’d never use them again on the chairs because it was such a pain in the neck to tie them onto the chairs just right. The ribbon was never wrapped just right and wasn’t tight enough to hold them right where I wanted them so I fought with them the whole season. It wasn’t pretty. This year my husband suggested that I try it again but use double sided tape for some extra support. Thank you to my hubby for this brilliant idea because it definitely made hanging the wreaths much, much easier. They’ve been up for almost two weeks and they are right where I put them! I added red accents to the wreaths by using red ribbon. The wreaths themselves are simple, which I’ve used as is before, but this year I kicked them up a notch by inserting an iced berry pick into each wreath. I prepped the dining server with cocktail glasses so that they are handy to reach for at the dinner party. 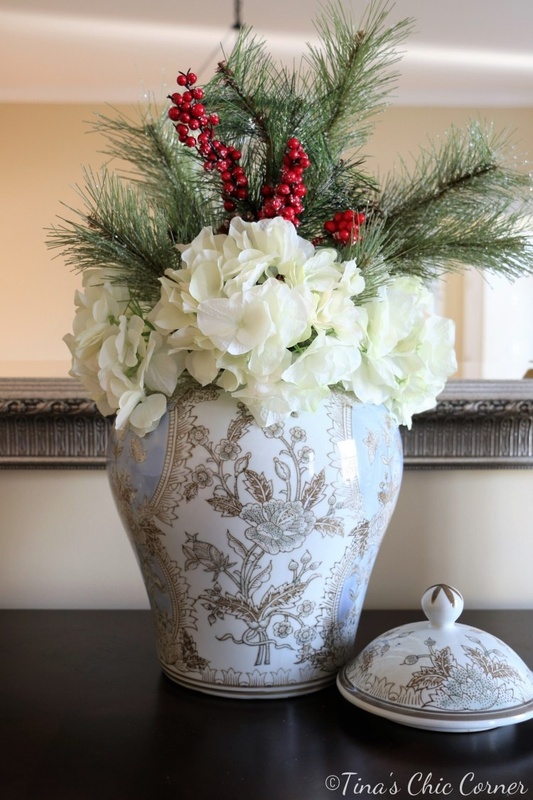 I also included a little pop of red in the greenery in the big vase so I could use red to tie everything together. Lovely, Tina. Did your guests leave? Everything looks so classy! 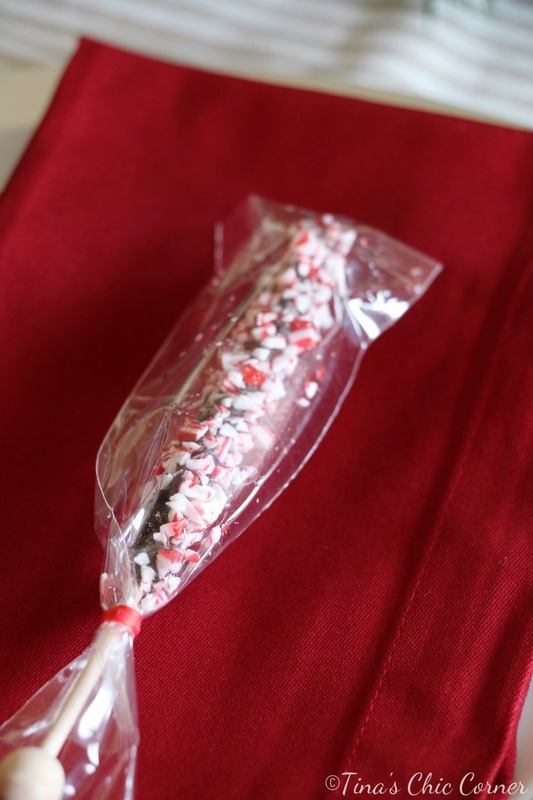 Love the chocolate stick stirrers they remind me of the rock candy. Haha does your family read your blog so now they’ll know about the baking mishap that you salvaged. I want to go to a Tina party :).